This chapter aims to assist firms developing pro bono programs by outlining the services available from community legal centres (CLCs), Indigenous legal organisations (ILOs) and other legal organisations. CLCs are independent, non-for-profit organisations that provide free referral, advice and community legal education service. They are accredited as CLCs by the National Association of Community Legal Centres (NACLC) and receive most of their funds from the Commonwealth government. CLCs are also key participants in law reform initiatives. Indigenous legal organisations provide specialised, culturally competent legal services to Aboriginal and Torres Strait Islander peoples, and are similarly government funded. In recent years new organisational models have emerged in the sector. One example is Salvos Legal Humanitarian, which provides free legal advice to individuals with the assistance of pro bono lawyers and which is funded by the commercial law firm Salvos Legal. It is important for a pro bono practice to understand the services that these types of organisations offer and to build relationships with them, as potential sources of pro bono referrals and as places where pro bono matters can be referred when the firm itself is unable to assist. CLCs, ILOs and other legal organisations are generally keen to partner with pro bono providers primarily for the purpose of improving access to justice for their clients. building the capacity of the organisation by providing secondees, giving advice to the organisation (for example, on internal matters including the organisation’s constitution, governance, workplace relations, marketing and media), and training and mentoring the organisation’s lawyers. These organisations also attract, train, utilise and retain a large number of high quality volunteers, the majority of whom are lawyers and law students. As a result of their day-to-day exposure to the clients and issues facing disadvantaged people, the employees of these organisations have skills in particular areas of law and practice, which lawyers working in firms may not have. An equal partnership that recognises the complementary nature of the parties’ skills and experience, and seeks an exchange of skills, will be mutually beneficial. See Chapter 1.14 Training and skills. For more information on developing partnerships with CLCs and case studies see What Works, Chapter 12 Community legal centres. There are around 190 CLCs in Australia.3 They range from centres with no paid staff to offices of ten or more employees, with most having three to six staff, including at least one employed lawyer. Many CLCs involve volunteer lawyers and law students in their service provision. There can be quite a high turnover of staff in CLCs, especially in rural, remote and regional CLCs. specialist centres that provide assistance to a particular client group or in a particular area of law. For example, there are CLCs which specialise in immigration law, disability law issues, and consumer credit and those that offer services targeted to the particular legal needs of women, young people or tenants. Note that many generalist centres may also be funded to operate a specialist service. For example, advising parents liable to pay child support, or providing a local tenancy advice service. The national peak body for CLCs is National Association of Community Legal Centres (NACLC). There are also State or Territory associations, some of which operate a secretariat which provides support to CLCs in that State or Territory. There is a national conference of CLCs every year, normally in August or September, which can be a good opportunity for pro bono practices to meet and network with CLCs. In 2013 NACLC received funding from the Commonwealth Attorney-General`s Department to establish a legal advice service for anyone interested in giving evidence or talking to the Royal Commission into Institutional Responses to Child Sexual Abuse. This is called Knowmore. It employs lawyers, cultural advisors, psychologists and social workers. There are also various networks of CLCs organised around particular issues or themes such as youth, welfare rights, human rights, tenancy, Indigenous women, disability rights, and RRR issues. These networks engage in policy work and joint initiatives concerning particular areas of law and can be another point of contact for law firms. CLCs provide legal advice, referral and casework services to clients and undertake community legal education, law reform, policy work and community development. CLC activities focus on areas of law relevant to disadvantaged clients where no other services are available. The areas of law covered by generalist CLCs include employment, social security, consumer credit, housing, discrimination, protection from violence, crimes compensation and those aspects of family law and criminal law not able to be covered by Legal Aid Commissions (LACs). Almost every CLC offers some kind of legal advice service, whether face to face or by telephone. Local generalist CLCs tend to operate legal advice clinics at their premises and/or at outreach locations. Advice clinics are frequently operated out of business hours for the convenience of clients and often make use of volunteer lawyers to provide advice. State and Territory specialist services provide advice clinics and outreach services but also offer telephone and sometimes email services due to the broader geographical location of their clients. Although anyone can obtain free advice from a CLC, they target their services to those in financial need. For many clients, CLCs are the first point of contact about a legal issue. CLCs are skilled in identifying a client’s needs and referring them to an appropriate pro bono provider, or agency, or providing advice directly to the client. Most funded CLCs are also able to offer a limited casework service. As CLCs have few staff lawyers and a number of competing priorities, only a small proportion of clients seeking advice are likely to be offered casework assistance. Matters are accepted according to guidelines developed by each centre having regard to factors such as the other services that are available in their area, the perceived needs of the local community, the requirements of any targeted funding they may receive, the hardship that may be suffered by the client if assistance is not provided, the likelihood that acting in a particular matter may benefit a group of disadvantaged people beyond the particular client, and whether centre staff have the relevant expertise to assist the client. CLCs will generally not undertake casework where other services are available, including private lawyers who are willing to undertake no win no fee litigation. Accordingly CLCs rarely provide assistance with personal injury, criminal, or family law matters where legal aid is available. CLCs are very active in providing community legal education (CLE). In 2013/14 CLCs undertook 4,266 CLE projects.7 These projects usually aim to provide information about avoiding legal problems or to assist the resolution of legal problems, or provide information to help people recognise their legal rights. The way in which CLE is delivered varies widely: from visits to schools and community groups, to working with local media or community development projects. Some CLCs also produce educational material in plain English and/or translated into community languages. Some, especially those that specialise in a particular area of law, prepare specialist guides for community workers and other lawyers. CLCs play an important role in identifying legal issues that affect their client groups. In 2013/14 CLCs undertook 878 law reform projects.8 CLCs do this through participating in advisory councils, writing law reform submissions and working with government. Through the experience of their advice and casework services CLCs acquire knowledge about the way in which the law or the absence of law affects the lives of their disadvantaged clients. 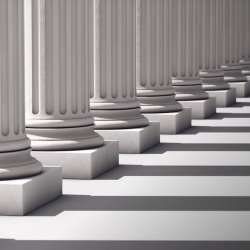 CLCs use this information to provide advice to government on policy development and work towards improvements in laws and the administration of the legal system. There are two primary organisations that provide free specialised legal services to Aboriginal and Torres Strait Islander peoples — Aboriginal and Torres Strait Islander Legal Services (ATSILS) and Family Violence Prevention Legal Services (FVPLS). Aboriginal and Torres Strait Islander peoples are drastically over-represented in the criminal justice system.11 In light of this over-representation and the complex challenges that Aboriginal and Torres Strait Islander people face, these services are needed to provide access to culturally appropriate legal services. ATSILS were established in every State and Territory over 40 years ago to provide culturally competent legal assistance services to Aboriginal and Torres Strait Islander peoples. ATSILS are Aboriginal and Torres Strait Islander community controlled NFP organisations which provide their services through funding from the Commonwealth Attorney-General’s Department. The critical principle underlying all ATSILS service delivery is their focus on, and ability to provide, culturally competent, efficient legal services to Aboriginal and Torres Strait Islander peoples.12 Many Aboriginal people who access ATSILS services experience language and cultural barriers, low levels of numeracy and literacy and distrust of the justice system. ATSILS’ staff are highly skilled in working with Aboriginal and Torres Strait Islander peoples, with particular attention paid to cross-cultural communication, use of interpreters, and ensuring clients are able to understand and meaningfully participate in court processes. Over the period 2011-2015, ATSILS delivered in total 604,519 legal assistance services, or an average of 201,506 per year.13 Over the same period ATSILS have operated an average of 84 outlets each year to a range of metropolitan, regional and remote communities.14 In a number of rural and remote areas ATSILS are the only free legal service available to Aboriginal and Torres Strait Islander people, which makes the provision of their services critical for access to justice. The National Aboriginal & Torres Strait Islander Legal Services (NATSILS) was established as the peak body for ATSILS in 2007. Through the expertise of its members, NATSILS has become an expert voice on Aboriginal and Torres Strait Islander peoples and the justice system. NATSILS regularly provides commentary and advice in relation to Aboriginal and Torres Strait Islander peoples, human rights, access to justice, social inclusion, systemic discrimination, evidence based justice policy, and, in particular, evidence based criminal justice policy. ATSILS provide specialist family law services in the areas of child protection, domestic violence and general family law matters, with a focus on seeking to maintain the family unit where possible. Given the disproportionate levels of family violence in Aboriginal and Torres Islander communities, and the number of Aboriginal and Torres Strait Islander children in out-of-home care, these services are critical, with the FVPLS usually acting for the women and children in the relationship. ATSILS provide legal advice, assistance, representation and duty lawyer services to clients in criminal law matters. An important aspect of their legal service is the provision of legal assistance 24 hours a day, 7 days a week to Aboriginal and Torres Strait Islander communities in metropolitan, regional, rural and remote areas of Australia. This service is vital to the timely access to legal services for Aboriginal and Torres Strait Islander people, particularly those who have been arrested and/ or detained. The prisoner ‘throughcare’ programs provided by ATSILS aim to reduce repeat offending by addressing the ‘throughcare’ needs of adults prisoners and juvenile detainees. ‘Throughcare’ is defined as the coordinated provision of support to an offender, beginning with their initial contact with correctional services and continuing until the offender has successfully reintegrated into the community. This service assists clients in developing post-release plans and in accessing appropriate service providers and specialist assistance. This is important given the complex and challenging needs of many of ATSILS clients, which include low levels of English, mental health issues and cognitive impairments. The ability of ATSILS to undertake law reform and policy work is inherently very limited due to the extremely tight funding environments in which they operate. Nonetheless, ATSILS both on their own account, and through NATSILS, provide advice and submissions on issues that relate to the justice system and Aboriginal and Torres Strait Islander people. ATSILS and NATSILS are uniquely placed to provide this advice because of their on the ground experience, and long standing service to Aboriginal and Torres Strait Islander communities. ATSILS provide a number of CLE programs. The provision of these programs is important given the evidence of low levels of awareness and understanding about civil and family law rights within Aboriginal and Torres Strait Islander communities.17 Therefore, CLE plays a key role in the prevention of, and early intervention in, legal problems, as it provides people with the necessary information and skills to prevent the development of civil and family law issues. representation for defendants of Domestic Violence Orders, which ATSILS are not currently funded to provide except in very limited circumstances. 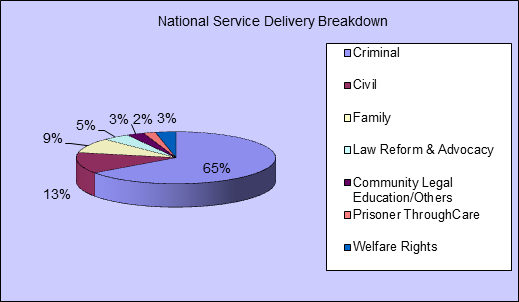 Service Delivery Overview,internal document, October 2013, pp 4-10. Family Violence Prevention Legal Services (FVPLS) are Aboriginal community controlled, NFP organisations providing holistic and culturally-safe frontline legal services to Aboriginal and Torres Strait Islander victims/survivors of family violence and sexual assault. FVPLS do not work with perpetrators of violence. FVPLS also deliver culturally — safe community legal education and early intervention/prevention activities to raise awareness of rights and reduce family violence in Aboriginal and Torres Strait Islander communities around Australia. the high number of legal conflicts within ATSILS. Reports have indicated that Aboriginal women and children remain chronically disadvantaged in terms of access to legal services, awareness and exercise of their legal rights and domestic violence support. In comparison with other Australian women, Aboriginal and Torres Strait Islander women are 34 times more likely to be hospitalised as a result of family violence21 and 10 times more likely to die as a result of violent assault.22 Nationally, more than 90 percent of the program’s clients are Aboriginal women and children. In May 2012, the National FVPLS Forum was established.23 It is currently comprised of 13 member organisations.24 The program is funded by the Commonwealth government to service rural and remote locations. Some FVPLS units have secured additional funding from State governments and other sources through which they can also service metropolitan areas such as Melbourne and Brisbane. The primary function of the FVPLS is to provide legal assistance, casework, counselling and court support to Aboriginal and Torres Strait Islander adults and children. Where resources permit, some FVPLS also provide assistance with other civil law issues arising from family violence such as police complaints, tenancy, Centrelink, infringements and child support matters. In addition to legal and counselling services, FVPLS strive to bring about community-wide change through a mix of law reform, policy and advocacy, community legal education and other early intervention and prevention activities. FVPLS are known for adopting a holistic, wrap-around service delivery model that prioritises legal service delivery while recognising and addressing the vast array of interrelated issues that its clients face. This approach recognises that clients typically have multiple, complex legal needs. Although there are slight variances between models adopted by FVPLS, all centres are heavily client-focused, with the goal of encouraging their clients to remain engaged with the legal system and to attend and participate in court processes. In addition to a lawyer, each FVPLS’ client is assisted by a paralegal support worker who provides essential non-legal help, such as practical and emotional support at court, referrals and liaison with other agencies. FVPLS have also established a reputation as legal services which are culturally safe and accessible to Aboriginal and Torres Strait Islanders, with programs and services uniquely designed to support their specific needs. For 16 years, FVPLS have developed strong relationships with local Aboriginal and Torres Strait Islander communities through their expertise in domestic violence, support for Aboriginal leadership and confidentiality. FVPLS provide legal services across a range of jurisdictions and legal issues. However, their capacity is subject to limitations in government funding. A number of Indigenous women’s legal services are currently operating throughout Australia. Most of these services are provided by CLCs, typically a women’s legal centre, although some services are provided by NFP organisations and independent incorporated associations. Women’s legal centres in New South Wales, Queensland, South Australia, the Northern Territory, Western Australia, and the Australian Capital Territory run ad-hoc programs which provide legal assistance to Indigenous women. In their capacity as CLCs, these centres provide legal advice, casework (including court representation), CLE and outreach clinics to Aboriginal and Torres Strait Islander women in rural and remote areas. In order to reach clients in distant and remote locations, these centres have introduced a variety of methods to make legal services more accessible. For example, the Women’s Legal Services NSW, which runs an Indigenous Women’s Legal Program, services an Indigenous Women’s Legal Contact Line which is available State-wide and free of charge. The line is answered by an Indigenous staff member who takes initial details from the client, and subsequently refers the call to a lawyer or another appropriate service. This provides an accessible, responsible and culturally-safe service for Indigenous women in New South Wales. Another way that women’s centres attempt to reach out to women in isolated Indigenous communities is to bring legal help directly to these communities. The Waburton Outreach project, organised by the WA Women’s Law Centre in partnership with the Ngaanyatjarra Pitjantjatjara Yankunytjatjara (NPY) Women’s Council, involves sending lawyers to Waburton (a remote Indigenous Australian community) and the surrounding area every six weeks to provide legal services and CLE for women. Indigenous women’s legal services are also provided by not-for-profit community based organisations. These organisations are either independent or receive funding from the government. Indigenous women’s services are also provided by independent organisations which have different approaches to CLCs. For example, the Kapululangu Women’s Law and Culture Centre30 in regional Western Australia organises cultural activities in addition to providing legal services as a way to alleviate social problems affecting women in Indigenous communities. Some of its trademark activities include Women’s Culture Learning Camps, Women’s Law Camps and Ceremonial Dreaming Track Treks. These activities are available to Indigenous women and children of the Kutjungka Region, and also Indigenous and non-Indigenous women from across the Kimberley and around Australia. The dual focus on law and culture aims to cater to the needs of Indigenous women and men (particularly from younger generations) so that they are able to develop pride in their Aboriginal heritage and greater resilience to withstand the multitude of challenges they face in their lives. Salvos Legal Humanitarian provides an example of a different organisational model in the legal assistance sector. This not-for-profit law firm provides free legal advice and representation to disadvantaged and marginalised people in several areas of legal need, including (but not limited to) criminal law, family law, housing law and debt. Services are provided in suburban locations in New South Wales and Queensland and through a national telephone service that targets RRR communities. Salvos Legal Humanitarian operates these services with pro bono assistance from volunteer lawyers, migration agents, law graduates, paralegals and barristers. Since October 2012 Salvos Legal Humanitarian has been fully funded by Salvos Legal, another NFP law firm that runs commercial practices in the areas of property, corporate and commercial law. The partnership between the two firms, both solely owned by the Salvation Army, enables Salvos Legal Humanitarian to operate independently of government funding or donations. 1 National Pro Bono Resource Centre, ATSILS PRO BONO GUIDE: A guide to the delivery of pro bono legal services for Aboriginal and Torres Strait Islander Legal Services (ATSILS) and their clients, October 2009, http://probonocentre.org.au/legal-help/atsils-pbg/. 3 National Pro Bono Resource Centre, Community Legal Centres, http://www.naclc.org.au/cb_pages/clcs.php. 10 See Australian Pro Bono News, September 2015 at http://www.nationalprobono.org.au/news_detail.asp?id=138. 11 While Aboriginal and Torres Strait Islanders comprise only 2.3 percent of the adult population in Australia they make up over a quarter (27.4%) of the prison population, and Aboriginal and Torres Strait Islander juveniles now comprise over half (52%) of all juveniles in detention. See Productivity Commission, Overcoming Indigenous Disadvantage Key Indicators 2014 – Report, Canberra, 2014, http://www.pc.gov.au/research/ongoing/overcoming-indigenous-disadvantage/key-indicators-2014/key-indicators-2014-report.pdf. 12 See House of Representatives Standing Committee on Aboriginal and Torres Strait Islander Affairs, Doing Time-Time for Doing: Indigenous Youth in the Criminal Justice System, Parliament of Australia, 2011, http://www.aph.gov.au/Parliamentary_Business/Committees/House_of_Representatives_committees?url=atsia/sentencing/report.htm. 13 Australian National Audit Office, Administration of the Indigenous Legal Assistance Programme, February 2015, p 16, http://www.anao.gov.au/~/media/Files/Audit%20Reports/2014%202015/Report%2022/AuditReport_2014-2015_22.PDF. 15 As at April 2015, the means test is satisfied if an ATSILS’ client is a juvenile, is solely on Centrelink benefits or earns less than $46,000 per year, although they will still need to satisfy other criteria such as a merit test and conflict check. ATSILS clients who earn more than $46,000 per annum can still be assisted, at the discretion of ATSILS, but will be subject to a sliding scale of client contributions based on factors such as income level, assets, number of dependent children, and spouse income. 16 See M Schwartz and C Cunneen, ‘From Crisis to Crime: the escalation of civil and family law issues to criminal matters in Aboriginal communities in NSW’ (2009) 7(15) Indigenous Law Bulletin 18. 17 See, for example, National Pro Bono Resource Centre, Pro bono legal services in family law and family violence: understanding the limitations and opportunities — Final report, October 2013, p 76. 19 It should be noted that the percentage in each service type does vary considerably between ATSILS. 20 Productivity Commission, Access to Justice Arrangements Inquiry Report, Commonwealth of Australia, Canberra, 2014, p 30 and 107, www.pc.gov.au/inquiries/completed/access-justice/report. 22 Australian Institute of Health and Welfare, Family Violence among Aboriginal and Torres Strait Islander people, 2006, p 66, www.aihw.gov.au/publication-detail/?id=6442467912. 23 National Family Violence Prevention Legal Services, Who we are, http://www.nationalfvpls.org/Who-We-Are.php. 26 Women’s Legal Services Australia, Aboriginal & Torres Strait Islander Legal & Advocacy Service, www.wlsa.org.au/members/aboriginal_torres_strait_islander_womens_legal_advocacy_service; Top End Women’s Legal Service Inc, www.tewls.org.au/projects.php; and Women’s Legal Service (SA) Inc, Aboriginal & Torres Strait Islander Women’s Program, www.wlssa.org.au/what-we-do/aboriginal-a-torres-strait-islander-womens-program.html. 27 Aboriginal and Torres Strait Islander Women’s Legal Services NQ Inc, www.atsiwlsnq.org.au/index.php. 28 Aboriginal and Torres Strait Islander Women’s Legal Services NQ Inc, Annual Report 2013-2014, 2014, p 12, www.atsiwlsnq.org.au/reports/ATSIWLSNQ-Annual_Report_2014_PRINT.pdf. 30 Kapululangu Women’s Law and Culture Centre at www.kapululanguculturecamps.com.